I have a big boomerang presentation in less than two weeks (400 students) and decided to get some practice in with boomerangs that were not long distance. I tossed a bag in the truck today and headed to the field at lunchtime. When I opened the bag it was full of Bob Burwell boomerangs and one Wycheproof hook. I started off with the Rippah which will be great for the demo. It works so well and looks like you expect a boomerang to look like. Then I was tossing the large traditional Bob gave me when I visited him in Brisbane. I think it was angry with me for not using it more because it continued to beat me up when I tried to catch it. Then again maybe my catching skills have declined since I am throwing LD more often and not required to catch them. I went through several other boomerangs including ther Adder and ET30, which look much alike. The Adder has been a favorite of mine for years so the ET30 will be one also. I dug out the C-Hook and was surprised to see 50M on the back. I fired it out there and didn’t have enough stuff for a full return. I then grabbed both Vipers and was tossing bullseyes with them. Wow was I into thowing them. I guess I should have tried the C-hook again but I was having too much fun with the Vipers. I am always amazed with the perfomance I get from them, with less effort than I expect. Lunchtime ended far too soon and it was back to work for me. 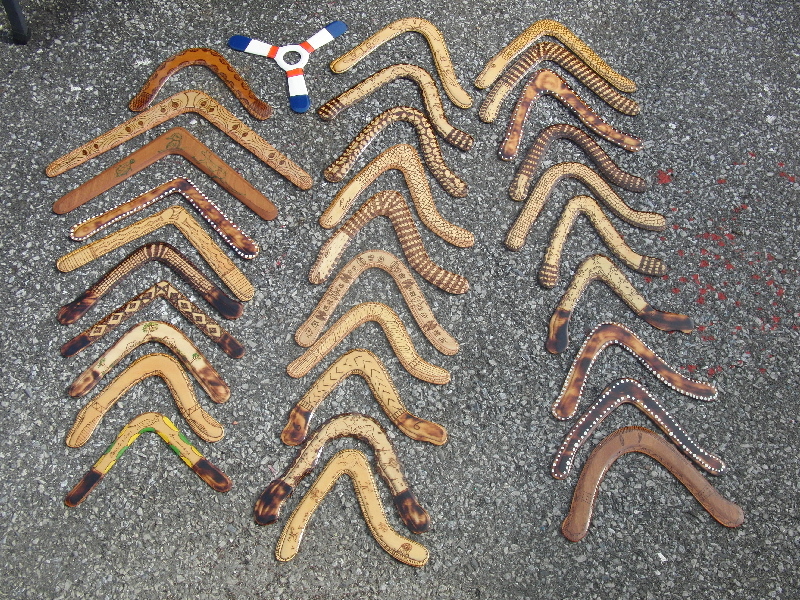 Here’s a photo of the Burwell boomerangs. Sunday Rob Stewart, Ian Guldner and I went to Lehigh U’s fields to practice for a long distance tournament. We spent nearly 2 hours throwing almost anything in our bags. We started with 90% size Voyagers and then moved on the full size Voyagers (phenolic, fiberglass and even carbon fiber), Milpas Reapers and even an Uwe Kitzberger shape. Toward the end I broke out 2 large size plywood Voyagers and we tested and tuned them. It was an great day together. I had my camera along and shot some slow motion video of our throws. For us it is interesting to see what we are doing so we can improve our mechanics. Ian was throwing LD for the first time today and he was releasing rather high. I had one throw that I threw into the ground. Anyway, if you have nothing to do, scoot on over to youtube, search for user “bvdrangs” and watch some. I uploaded 16 from Sunday, all in slow motion.